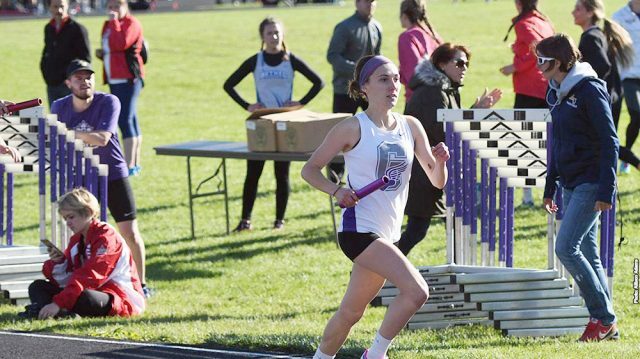 ALLENDALE, Mich. – Ollie Smith, a sophomore, and Jill Steinmetz, a senior, led the charge for their respected squads this past Saturday as both the Goshen College men’s and women’s track and field teams traveled to Grand Valley State to compete indoors at Mike Lints Alumni Open. Smith stamped his mark in the record books as he broke the GC 600-meter indoor record with a time of 1:23.20, shaving nearly a second and a half off of the previous record set in 2006. Along with Smith, the Maple Leafs were led by Josh Bustos and Ari Benjamin, both competing in the 60-meter and both setting personal bests. Bustos finished with a time of 24.43 while Benjamin came in just behind him with a 24.90. Two first-years contributed in big ways as Lukas Kanther added two heat wins in the 200 and 400-meter races while Jacob Gerber led the way for the throwers for the second week in a row. Gerber topped his personal best with a throw of 33 feet, 10 ¾ inches in the shot put as the Goshen men finished in 14th place with a score of 167 ½ points. Steinmetz set career notches in both the 200 and 400-meter events for the GC women, finishing with a time of 31.95 in the 200 and 1:08.51 in the 400. Steinmetz also recorded the team’s top finish of the day in the 600-meter race, finishing in 20th place. Mara Beck, a junior, set the other team’s personal record on the day with a time of 6:07.48 in the mile run. Throwers Suzette Rodriguez and Kassandra Rodriguez, both first-years, led the Maple Leafs in each of their events. S. Rodriguez posted a 39-foot, 10-inch toss in the weight throw, finishing in second place in her flight. K. Rodriguez placed 24th in the shot put. The Maple Leaf women finished in a six-way tie for 15th place. Both teams hit the road next Saturday as they travel to Marion, Indiana to compete in the Indiana Wesleyan Midwest Classic. Events for the day are slated to begin at 11 a.m.